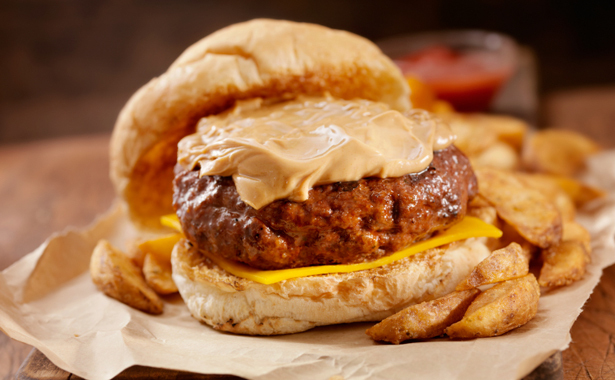 We don’t need a holiday to celebrate peanut butter, but it’s a good excuse. This year, in honor of National Peanut Butter Lover’s Day, we decided to take the beloved PB sandwich to the next level, from the deliciously inventive (like PB and rose petal jelly), to the daringly unsanctioned (by us) PB and tuna fringe. PB Eggs Benedict: Sub creamy peanut butter for Hollandaise sauce and add sesame oil for an Asian twist on the brunch classic. 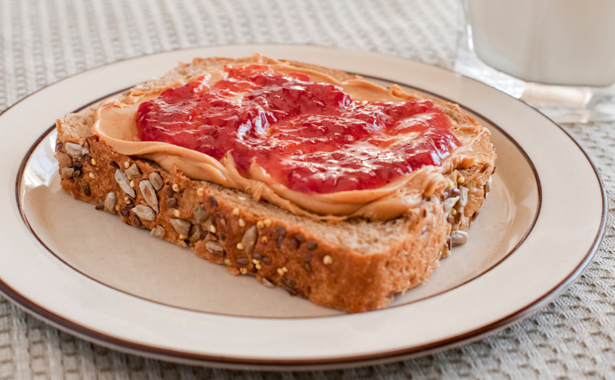 PB egg and cheese: What to eat … peanut butter toast or fried eggs? Why not both? Born from one blogger’s have it all (for breakfast) mentality, this sandwich merges peanut butter toast with fried eggs and cheese. Waffle it: Make your favorite peanut butter sandwich and toss it on the waffle iron for added crunch. With French flair: Peanut butter and jelly on French toast will make all the other bread in your kitchen seem boring. Add cornflakes: Part French toast, part fried chicken, this sandwich is coated in crushed corn flakes and grilled. You’ll want to start and end your day with it. Wrap it up: For breakfast on the go, mix peanut butter with honey, granola, nuts and dried cherries and wrap it all up. Exotic preserves: You’ll never go back to grape once you try Habanero apricot jelly. There’s no limit to the unusual jellies and jams around from rose, hibiscus, prickly pear and whiskey clementine, to lavender and baobab. Whole fruit: Moms are always on the lookout for the latest ways to keep kids interested. Ditch the jelly and insert their favorite fruit, whole. Start with orange slices, apples, bananas or grapes. 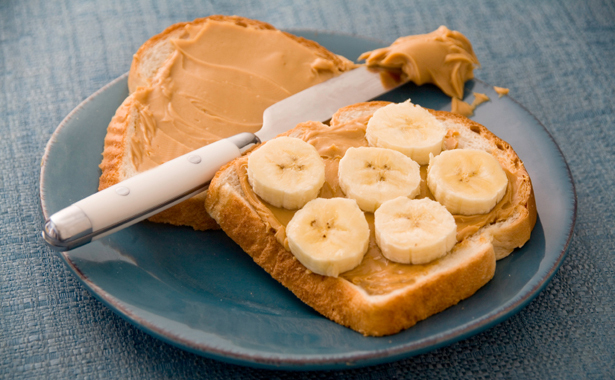 Fruit and cream cheese: Make a peanut butter sandwich that tastes like peanut butter cheesecake. Simply add strawberry cream cheese or blueberry jam to create your favorite flavor. The matrix: Create nine sandwiches in one. Use six different spreads to make three rows of peanut butter and jelly on one slice of bread and three columns on the other. The result: nine transcendental squares of flavor pairs. Pickles: It’s not as strange as it sounds, say lovers of this duo. Speared, sliced, whole—pick your pickle and take a bite. Potato chips: If you like mixing sweet with salty, PB and potato chips will be your new favorite food group. Chocolate-covered potato chips: What’s better than PB and potato chips? PB and chocolate-covered potato chips, of course. Pretzels: Spread a thick layer of peanut butter between pretzels instead of bread. Dip the mini-sandwiches in melted chocolate, take a batch to your next party and watch them vanish. Celery: Top celery sticks with peanut butter and raisins and eat it on a hot dog bun for the sandwich version of ants on a log. Tomato: It seems unusual, but this combo has been around awhile. Some of its biggest fans also add mayo, lettuce, salad dressing or even banana. Onion: This odd duo has devotees all over the web. Some have reportedly been eating peanut butter and raw onion since they were kids. Cabbage and Carrots: Bring out your inner Thai with a combo that tastes almost like a lettuce wrap, especially when you add a dash of soy sauce. Seinfeld: The famous comedian claims he’s been a peanut butter fanatic since he was a kid. New York City’s Peanut Butter & Co., a peanut butter sandwich shop, named their peanut butter, honey and cinnamon bagel sandwich after him. 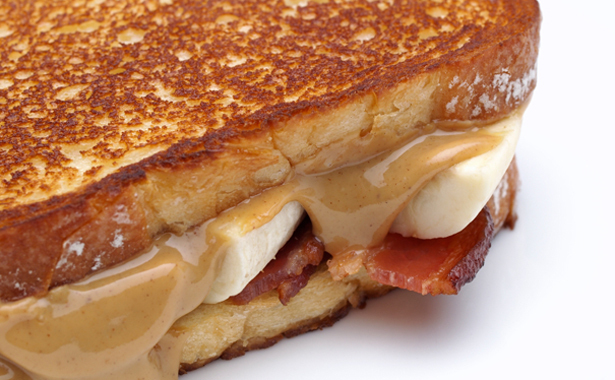 Elvis: The King loved to fry his peanut butter, bacon and banana sandwiches. His mom used to brown them in a frying pan with butter. 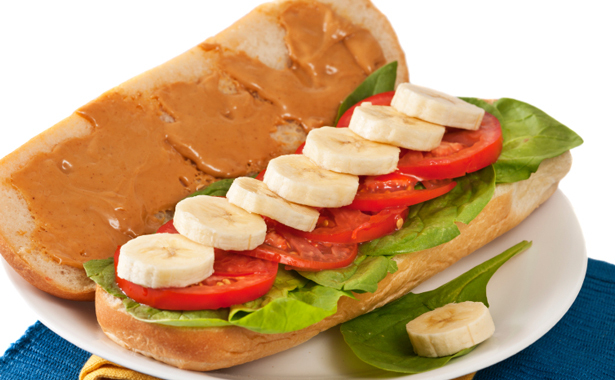 Bill Clinton: In numerous newspaper interviews, the 42nd president chose peanut butter and banana as his favorite sandwich. George W. Bush: Peanut butter and honey was one of the president’s favorite lunches while living in the White House. Chocolate: Chocolate makes everything better, like chocolate bread with PB and raspberry jam. Is it a sandwich or dessert? Either way, we’ll eat it. Fruit: Spread peanut butter between two slices of banana or apple and add a square of dark chocolate. It’s a delicious treat that takes seconds to make. Puzzle it: Get a little artsy and use a puzzle-shaped cookie-cutter to shape the bread on your favorite PB sandwich. It’s a hit with kids and kids at heart. Cake: Peanut butter and jelly between cake slices? We don’t know anyone who would say no to that. PB & sushi: No chopsticks required. Spread peanut butter and jelly on a slice of bread, cut and roll into sushi pieces. Tuna: There are more than a few admitted PB and tuna connoisseurs out there combining their PB with tuna, mayo and occasionally cucumber. Tuna & PB burger: Even Bon Appetit has jumped on the PB burger bandwagon. Some recipes add bacon, which as we all know, makes everything better. Sardines: The peanut butter made it better, according to a YouTube video of people who actually tried this combo. They liked the saltiness of the fish mixed with the crunchiness of chunky peanut butter. Salmon: Whether you’re using salmon cream cheese or a grilled plank of the fish itself, we’ve also seen internet evidence people have actually tried this combo–and enjoyed it.